A pragmatic U.S. Marine observes the dehumanizing effects the Vietnam War has on his fellow Marine recruits from their brutal basic training to the bloody street fighting set in 1968 Hue, Vietnam. I always looked at Apocalypse Now and Full Metal Jacket as two good Vietnam movies. I however always liked Apocalypse Now more. I never really appreciated the structure of FMJ. The story is basically told as two separate stories. Yes, separate. The first one is great in its own right, but the second one is the one that bothers me. I never felt Joker was a great character. I'm not sure if it's because of the actor, the script or the performance, but I never really seemed to care much for him. So we have our main protagonist in Vietnam. He's not fighting, just taking pictures. Fair enough, he'll probably grow up being around these real warriors and eventually be part of the fighting core of that unit? Wait...we never get to see that, because the movie ends before it even began. I am sure mr. Kubrick forgot to show us the last hour of the movie! I think this movie is one of more overrated movies out there, but there are still some very good bits here and there, so I'll still give it an ok score! I've seen this movie before, but not while trying to notice why it is so respected. And it is actually very good. And it's way of telling the story that makes it so good. 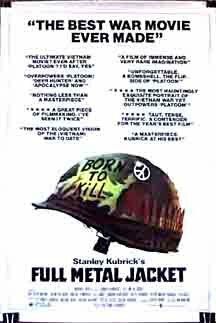 It also handles the subject of the War in Vietnam in a very controversial way, at least with American eyes. So the movie is two parted, first part shows a group of marines training and preparing for going to Vietnam. It shows ups and downs, but mainly downs, what is kind of the premise of the movie. The second part takes place during the war where you follow some the same people from the first part. This where the movie really gets gritty. Earlier it has only shown people in "voluntary situations" who acts very inhuman, but now that the the soldiers are cornered other stuff starts evolving. I was afraid that this one was gonna be too marked by time, but I think the age of the movies just makes it even more believable, cause that's what it is, and that's whats scares one when watching.